My recent post on the Virginia Tech energy study generated a lot of interest. I'll tie up some loose ends here. Geoff Klise, former student who's now at Sandia National Laboratories (SNL) in Albuquerque, commented on SNL's efforts to develop an integrated water-energy model for planning and management purposes. Geoff said it is about a year away. He also advised me of a report released in February 2008, Energy Demands on Water, Report to Congress on the Interdependency of Energy and Water. Yep, yours truly missed this one. And finally, a reminder: I posted about the SNL Mike Hightower-Suzanne Pierce commentary "The energy challenge" in Nature last month; here is the article. I am not an energy-water nerd, but SNL is doing some of the best work in this area. My hat's off to them. No, I'm not on their payroll. The Office of Water of the EPA will host a public Webcast on 8 May 2008 , 2:30 - 4:30 PM EDT, to discuss and receive feedback on its National Water Program Strategy: Response to Climate Change (available here). Complete information, including Webcast registration, is available at this WWW site. Registration began on 23 April. You can also submit comments on the Strategy at the same site. Vermont Protects Its Ground Water: Violation of NAFTA? Their New Hampshire neighbors might sneer that they are "quiche eaters" (Vermont does make some wonderful cheese) but when it comes to protecting ground water, the Green Mountain State folks don't want strangers to pump too much of their precious ground water. Today's Christian Science Monitor has Tom A. Peter's story. So the Vermont legislature just passed a bill that establishes a water permit system, which Gov. Jim Douglas (R) will likely sign. The law declares ground water to be a public trust and requires all enterprises pumping more than 57,600 gallons per day (40 gallons per minute) to obtain a permit. Most farms are exempt. The amount allowed without a permit is not insignifcant - it's about about 65 acre-feet per year. That's actually a lot of water from a so-called "exempt" (exempt from a permit or water right) well. Here in Oregon, we allow an exempt well 15,000 gallons per day, which is a lot; Washington allows an exempt well to pump 5,000 gallons daily. New Mexico, much drier that OR, VT, or WA, allows 3 acre-feet per year or about 2,700 gallons per day, < 2 gpm. So let's say you pump 57,000 gallons per day; no permit is required. That's enough to bottle over 200,000 one-liter bottles of water daily (I am conveniently neglecting the water used in the process), or over 80 M bottles per year. That is not a huge bottling operation, but it's not small, either. There could be a problem, though: Vermont's measure may violate the North American Free Trade Agreement (NAFTA), since it could constitute a barrier to international trade. If a foreign company believes that its ability to conduct business is hindered by the law, then it can file a claim against the state under NAFTA. One Canadian firm already pumps Vermont ground water and bottles it in New Hampshire for sales across the country. Other firms may be considering bottling operations. Again, Vermont has "cachet". Some have warned that NAFTA would have this effect and compromise the ability of border states (or provinces) to manage/allocate their water. Vermont believes it will not be a problem, because all enterprises are treated the same; international firms are not singled out. Alyssa Neir and I broached these NAFTA issues as they might develop along the USA-Mexico border. But time will tell, and I suspect this'll get interesting. Note added on 11 June 2008: Gov. Jim Douglas signed into law legislation declaring Vermont's ground water a public trust and establishing a permit system. Read more here. What could possibly cause massive heartburn for both Maude Barlow, the Canadian Crusader, and the bottled water industry? Infected, that's what. Yes, the SciFi Channel managed to give both sleepless nights with its own made-for-TV (aka "straight to DVD") movie, Infected, a semi-decent flick about bad aliens who come to earth looking for human hosts to "grow" their slug-like babies (the adults are insect-like, but don human skin so as not to scare the locals). Hmmm. Let me guess...the writers saw Alien. So how do the aliens wreak havoc on humanity? Well, having monitored our media for a number of years, they know humans are real big suckers for bottled water. So they decide to enter the bottled water business, but they contaminate their water with an extraterrestrial amino acid to better prepare the humans, who also get a plague-like disease as a side effect. 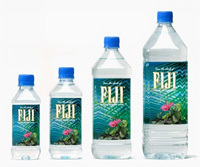 The company, Whitefield Industries, supplies the unsuspecting populace of Boston (with Montreal playing that role) with cheap (but not too cheap, else the humans won't drink it) bottled water (but none of that overpriced Fiji Water stuff). If that's not bad enough, the slimy arthropods also grow cheap produce (the bugs also know humans are seduced by cheap but good food) with their contaminated bottled water, further spreading the nasty amino acid. This nefarious plot is discovered by a worker at the city's Water Resources Department, who soon is killed. Two newspaper reporters, former lovers but now on the outs, must team together to defeat the forces of evil (bottled water). They succeed after a bit. A digression: SciFi movies have at least two things in common: 1) one or more has-been stars: 2) a climactic scene in what looks to be the basement of an industrial facility, one with plenty of pipes, valves, cables, tanks with flammable fluids, etc. This one was no different. Judd Nelson and Isabella Rossellini (say it ain't so, Isabella!) lend their awesome talents to this flick. Both play aliens, but Nelson is a good one. Isabella's big moment comes when her breasts explode and two insect-like appendages come flying out to "accost" our hero and heroine. Tears welled up in my eyes. She gets killed by the boss insect, Mr. Whitefield (real name: Zxykownh), soon after that. So it's easy to see that bottled water's image is tarnished, but why would Maude be perturbed? PRIVATIZATION! We've got a private company supplying Boston with water, people! See what happens when you let private companies into the water business! Aliens and slugs! And Maude, this is a Canadian movie! The excellent UK quarterly journal, Waterlines, has a new look with the recently-issued January 2008 (Volume 28, No. 1) issue. But the changes are more than cosmetic: it's now refereed, with longer peer-reviewed articles, short reports, book reviews, on-line access, etc. Waterlines is devoted to water, sanitation, health, and waste issues in developing countries, and bridges the gap between research and practice. I have found it to be invaluable. Check out the changes here, where you can request a sample copy, view guidelines for contributors, and subscribe, too. Note: If you do subscribe, make sure you enter your home address. If you have the journal sent to your business address, the publisher will charge you for an institutional subscription, which is twice as much. Published since 1982 Waterlines is a refereed journal providing a forum for those involved in extending water supply, sanitation, hygiene and waste management to all in developing countries. Waterlines aims to bridge the gap between research and practice: it encourages papers written by researchers for the benefit of practice and those written by practitioners to inform research and policy. It highlights information sources and promotes debate between different perspectives. Waterlines considers the key challenges facing those in the water and sanitation sector – engineers, health professionals, community development workers, researchers, policy makers – and suggests how these issues may be tackled using affordable, sustainable systems with reference to wider policy and institutional frameworks. Each issue concentrates on a key theme within the water and sanitation sector. Recent and forthcoming themes include: Where are we with sanitation? ; Ecosanitation; Private sector participation at the local level; Integrated water resources management. • ‘From our water correspondent’ – a regular letter from a water professional dealing with tough problems on the ground.